MSE Creative Consulting Blog: Christmas: "Strong Tornadoes"
The tornado threat for Christmas and Christmas Night into the morning of the 26th remains high, especially for this time of year. Let's break down the severe weather threat in chronological order. The Storm Prediction Center has increased its tornado probabilities for the period until 6am Christmas Day. On this map 5% is the significant threshold. In spring, this would be impressive. 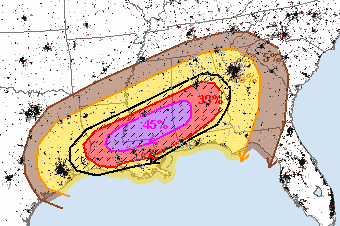 The hatched area the threat of strong tornadoes from near Houston through Lake Charles, New Orleans, Baton Rouge, Jackson, Birmingham, Mobile, and to the westernmost suburbs of Atlanta. The probabilities of 45% are extremely high -- something achieved, on average, maybe three days a year. Please make sure you have a NOAA weather radio, one of those cell phone apps that alerts you, and/or are monitoring the local television. The tornadoes will move relatively fast, so it is critical you stay up on the latest information as storms approach. 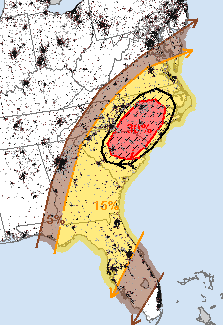 It is too soon to know exactly but the hatched area from Augusta through Columbia to Raleigh will likely experience either tornadoes or damaging winds. This far out, these can sometimes be a little too far east, so if I were in Charlotte, I'd be paying attention. If you have a copy of my book, When the Sirens Were Silent, in the back are three pages on thick paper. Those are the latest versions of the tornado safety rules for home, office, and car. You might want to refresh your knowledge. Those pages are perforated, so they can be lifted out and posted in a convenient place.